The Nagarahole National Park lies in Mysore and Kodagu districts of Karnataka. It was once the hunting grounds of Mysore kings. The park is separated from Bandipur National Park by the Kabini reservoir. 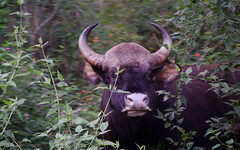 The forests of Nagarahole are home to Tiger, Bison, Elephants etc. Nagarahole National Park is also known as Rajiv Gandhi National Park. It comes under the Project Tiger scheme. Inside the park coracle boat riding facility is available in the Kabini river. Best time to visit the park is during the winter months of November to February. Various accomodations facilities are available at Nagarahole NP itself. Kabini River Lodge ph:08222-32181,44401 Jungle Inn ph:08222-46022,52181 Forest Department Cottages ph:08272-25708 (Conservator of Forests, Kodagu Circle ) Various home stays are also available near to Kutta, Srimangala and Gonikoppal. Nagarahole is 240km from Bangalore. Route 1: Bangalore - Mysore - Hunsur- Ummattur - Murkal - Kalla halla - Nagarahole. KSRTC runs one Rajahamsa from Bangalore to Kutta, which is only 7km from Nagarahole NP. Ample number of KSRTC buses are available to Hunsur (45km) and Gonikoppal (32km) from Bangalore. From there both private and KSRTC buses are available till Nagarahole.